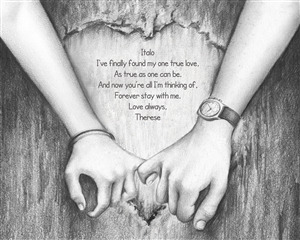 Holding Hands - Pencil Sketch Print with Custom Text for Anniversary, Valentine's Day, etc. We will send you a preview email with your text for approval. Enter your custom text or other instructions here. ALEX I've finally found my one true love, As true as one can be. And now you're all I'm thinking of, Forever stay with me. Let the forest whisper your love! Reveal how you feel to that someone special with this touching saying or your own thoughts in the carved heart, he/she will surely love this personalized pencil sketch print. A myDaVinci exclusive as always. All of our Art My Way products are exclusively done by creative myDaVinci artists, with their own passions and interests in life. You could preview the artwork with your wordings instantly when you place your order. You are fully responsible for the wordings that you input online. Please double check your text for errors before you submit your order. If you need special wording arrangement, please write your inquiry in the "Optional Instructions" section. Printing materials: Textured fine art paper, quality cotton canvas or semi-gloss premium luster photo paper. All are made in USA. Inks: Genuine Canon LUCIA EX ink products. These inks are known for their vibrant range of colors, scratch resistant surface, and exceptional color quality. Frames: All of our frames are made from recycled wood. We have both traditional and modern style frames to fit your taste or decor. Framing: Your artwork is printed, then framed or stretched (for canvas print only) in our Chicago art studio, with proud craftsmanship. Wonderful, very well done product to buy!! I am very happy with the picture and gave it to my husband for Valentine's Day. I am very satisfied with my purchase, it looked awesome, I will be ordering more from this company. Couldn't believe I found this picture!